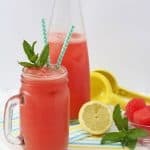 This Watermelon Lemonade makes a really refreshing and healthy drink for kids this summer. Easy to make with just a few natural ingredients! Add the sparkling water, watermelon, lemon juice and honey to a blender and blitz until smooth. Strain the lemonade through a sieve into a jug to remove any seeds. Serve immediately over ice and with a sprig of fresh mint. The lemonade can be stored in a sealed jug or bottle in the fridge. Shake well before drinking.